It's the summer of 1994 in suburban Chicago: "Forrest Gump" is still in theaters, teens are reeling from the recent death of Kurt Cobain, and you can enter a sweepstakes for a spaceship from Jupiter to land in your backyard. Welcome to Margaret Wappler's slightly altered 90s. Everything's pretty much the way you remember it, except for the aliens. The family starts logging the spaceship's daily fits and starts but it doesn't get them any closer to figuring out the spaceship's comically erratic behavior. Ernest's wife Cynthia and their children, Alison and Gabe, are less concerned with the saucer, and more worried about their father's growing paranoia (not to mention their mundane, suburban existences). 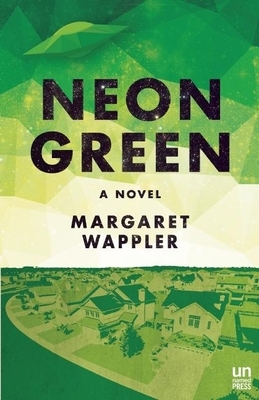 Set before the arrival of the internet, "Neon Green" will stun, unnerve, and charm readers with its loving depiction of a suburban family living on the cusp of the future. Margaret Wappler has written about the arts and pop culture for the "Los Angeles Times, Rolling Stone, Elle, The Believer, The Village Voice," and several other publications. Her work has appeared in "Black Clock, Public Fiction," and the anthology "Joyland Retro." "Neon Green" is her first novel. She lives in Los Angeles.